What I love in Bridgeport is the view of the city. To look at all these buildings is really a unique experience in the Sims. Even if it wasn’t the idea I had for a sims 3 aparment expansion, I really like this amazing view. It makes us have a impression of big city. I this plastic bag, I think it’s from Pilar. I’m using it always. It has two slots into it. This “puff” is a table in fact, and it goes well with many patterns. It was a bit lost on my game, but I felt happy to use it again. The study corner is my prefered part of this bedroom. I love these paintings from the eiffel tower, I think it downloaded them at TSR. I’m always using them too. An object I wouldn’t know how to live without is this computer. How come the ones from the game are so ugly? The colorful pattern is from EA. I think it’s very cool to customize what the game offer to us. The closet area is made of many different parts. The shelves from Luna, the wardrobe from angela and the fake doors by Mango. Decor from Jope and a conversion made by me. This bed was my very first bed conversion. It’s from HolySimoly. I wish their police would allow me to share their files. The objects they create have a very good quality. This pic makes me remeber of Moxxa because she loves this bed and I stole her idea to leave glasses to read on the end table. I converted these glasses from MTS. The living room has bright colors too. I added super colorful paitings, you can find them in TSR (I think). 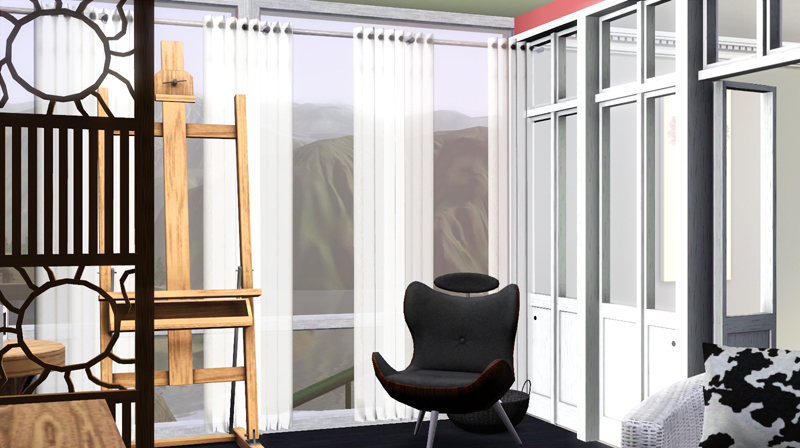 I love to make my sims learn how to paint. So I saved half of the living room space for a painting corner. These windows from Madaya do a great room divider as well. I converted this room divider from Jasmine and Ama (@BPS) with the Blue Bedroom objects. I didn’t like the result of all objects, so I won’t post them. 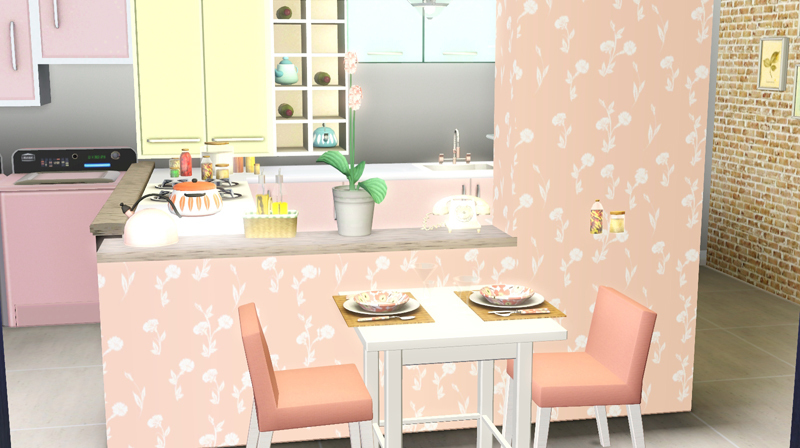 After the all bright colors I decided to add some pastel to the kitchen. 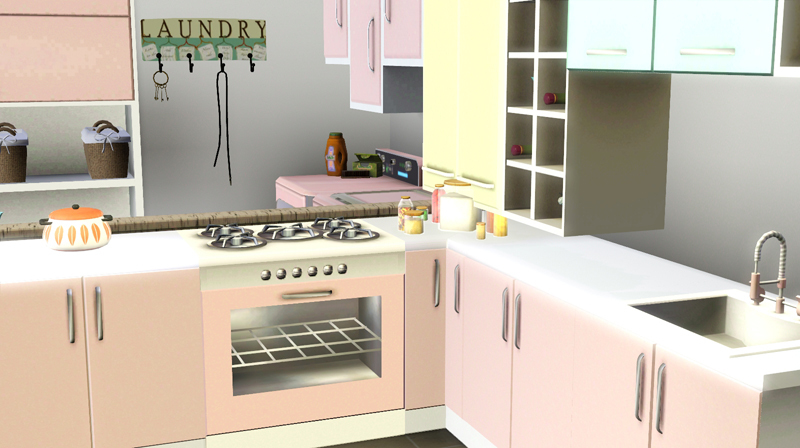 Apart from the game kitchen that came with Late Night, I didn’t have any other modern kitchen. So I grabbed this one from Simcredible at TSR. It recolors very well, has many objects and slots! 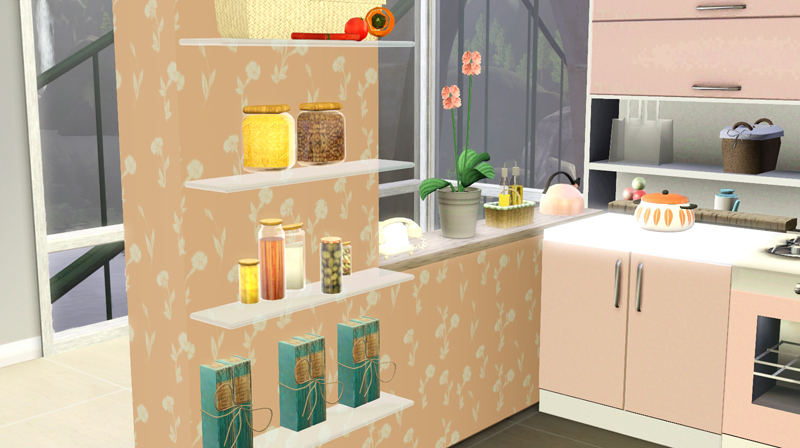 These transparent shelves are great! 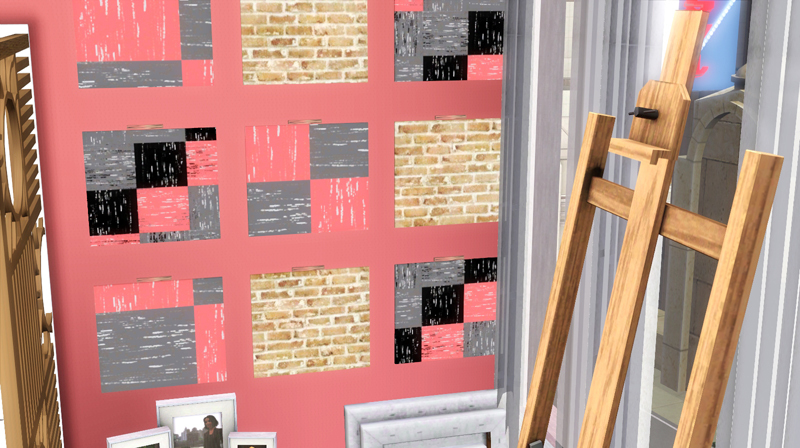 I added these cute paintings from RD on the wall to add a bit of country in the decor. Yes, I decided to give another try to the laundry system. I hope it won’t bother me too fast! This is beautiful will you make it available for download. I'm in love 'bout this house! Can you put this to download? Girl, you're a very talented. Im in love with this site. this is sooo beautiful!!! Ohh so many cute comments!! Thank you everyone, first for dropping by, and second for leaving these kind comments!! It means a lot to me! Sorry, I took some days to add them here because I was travelling. I really enjoyed decorating this house, and I'm so glad you liked it!! I don't know yet if I'll put it to download because it has a ton of CC and I'm not sure if I'd be able to do the CC list… I'll see what I can do. Right now I'm full of work in RL, I'll check what I can propose you in a few days. Lots of love! *Drooling* me wants to buy the game now, as in now. AMAZING DESIGNS!!! i'd love if there was an upload of this for my new legacy! Very beautiful. Will you make it available for download? Please! Ahhh! I'm so in love with this. I really wish you could make it for download because it's absolutely spectacular. You did a fantastic job! Rubi I'm glad you enjoy my blog! This is just AMAZINGLY BEAUTIFUL. I loveeeeeeeeeeeeeeee it!! I wouldn't mind living in there myself. The colour pink gives me a happy vibe, so I'd constantly be in love with entering the place. Tem como postar para download? I love this Apartment! 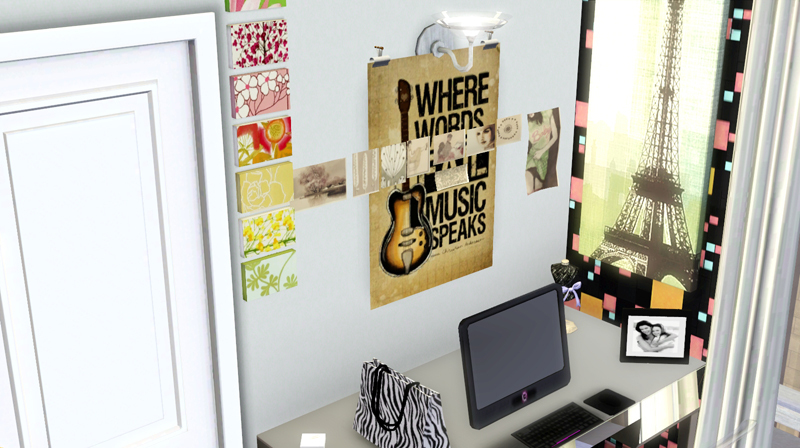 I would like to know where I can find the bed (for Sims 3) and the pictures frame on the desk. Absolutely stunning! Your sites are sooooo gorgeous. It's a feast for the eyes! This is absolutely gorgeous! I love love love the bedroom! 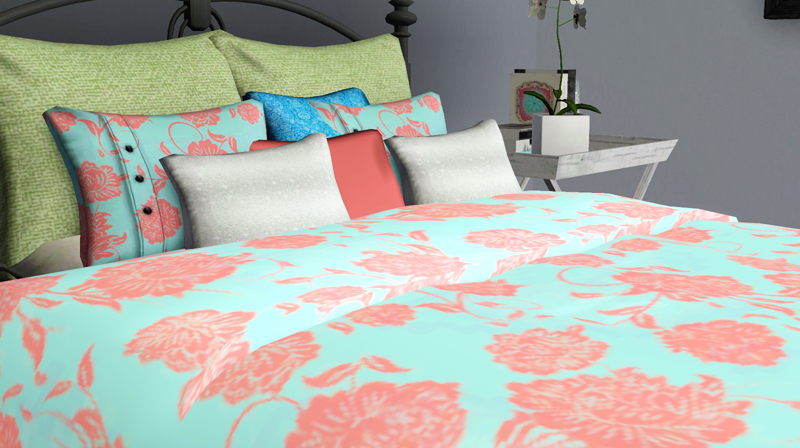 Thanks for making this it is lovely but where can I get those pillows because I cannot find them on Awesims! I can't find that amazing plastic bag anywhere! Are you sure it's by Pilar? I NEED IT IN MY GAME! Amazing decor by the way I'll be modelling my new apartment on this one! Onde acho a prateleira transparente? aw omg this is so fancy and beautiful. also inspiring and so is your site. 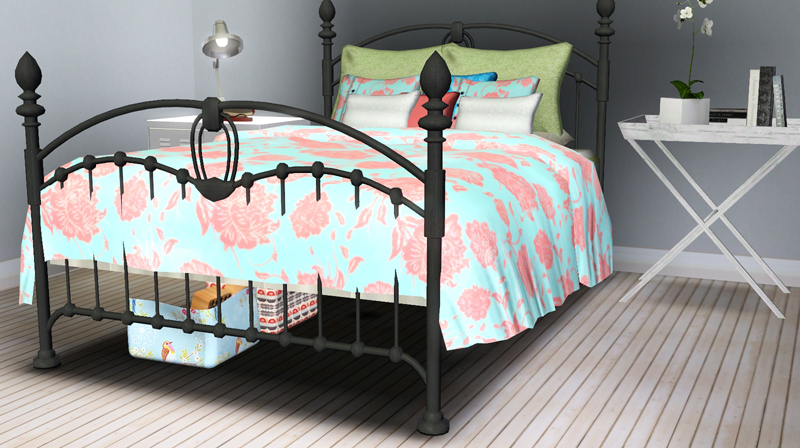 That bed from HolySimoly was always my favourite in sims 2. I love it to pieces! I wonder if you could ask HolySimoly if you could share it because lots of people probably want to have it in sims 3 too? And if they won't let you then you could at least give them a hint that people want it in sims 3 too. Could you do this? I really want that bed. God I love this I wish I could have a house like this! I really hope they will release a sims 3 version. I also have other objects converted that the creators wouldn't allow me to share. 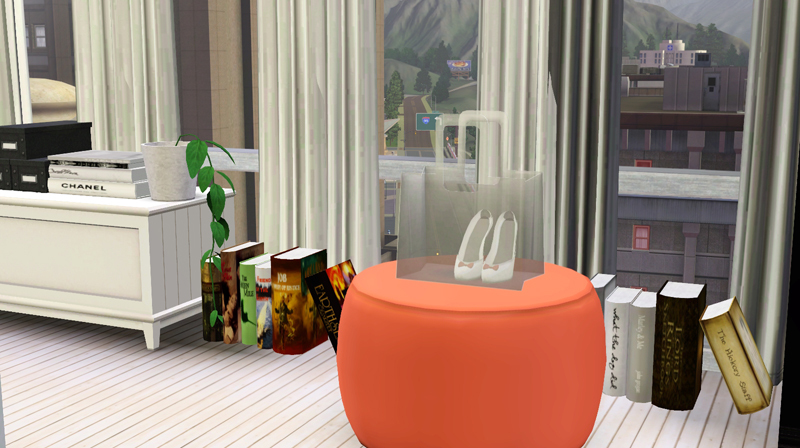 It is a shame, I really hope they'll convert the objects for sims 3 or change their tou. Beaaauuutiful apartment!!! Inspired me a bit on one I'm working on. Quick question, where did you find that large cabinet in the laundry area? I swear I've seen it before but now I can't find it anywhere. first I want to say that I really love your blog! I get inspired by your creations and decorations, they are awesome and so lovely. In the kitchen of the apartment, there is a fake wall or something where the glass shelves are at and wehere the table stands in front. Do you know what I mean? Where is it from? 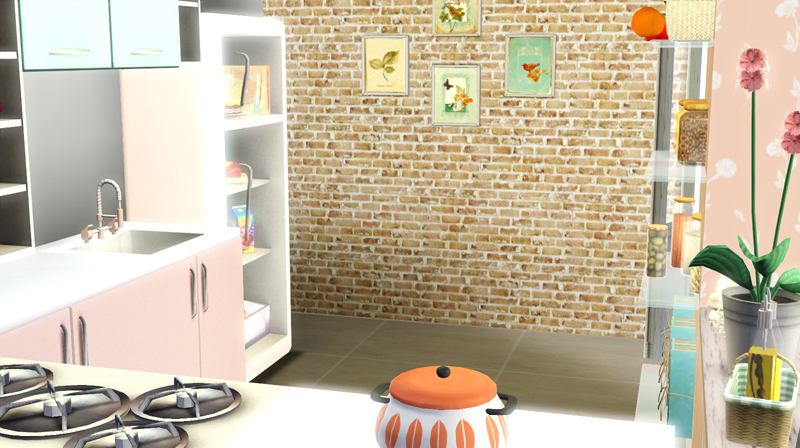 I can't find it anywhere and it doesen't belong to the kitchen of Simcredible, does it? are the glasses you converted available for download? Hey i love your work i just really really want those glasses in a case by the bed, anyway you could send them to me or tell me where to download them? Thank You!! I love the apartment! Personally I always stick to houses because I find that the apartments in Sims 3 are too small, but I absolutely love this one! If you can remake it some how could you post it? Its perfect for my self sim. 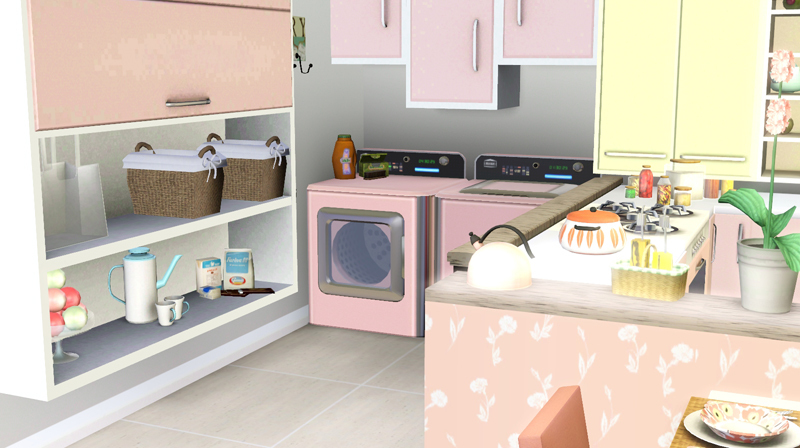 I don't think my last attempt at posting here worked so I'm trying again… I really love the apartment and if you find all of the CC and are able to rebuild it I hope you share it because it is gorgeous! Could you tell me where the guitar poster is from? Its perfect for my self sim! 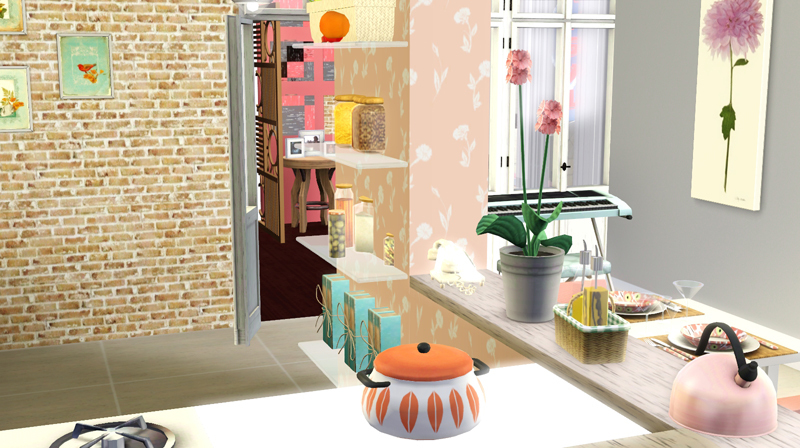 This apartment has given my tonnes of inspiration (I also mainly stick to country decor) so thank you, and I hope you continue making incredible items!